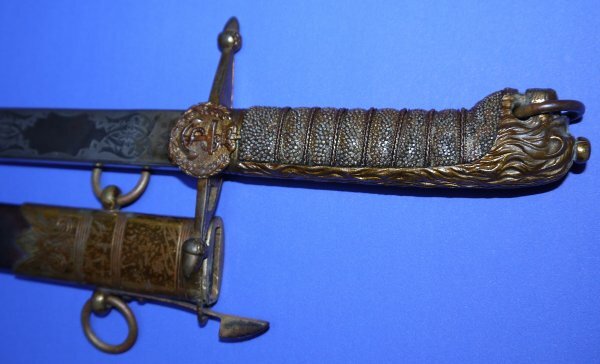 In very good condition, a scarce version Boer War Era / Late Victorian British Royal Navy Midshipman's Dirk. Supremely well gray / grey etched with "Gieve & Sons Portsmouth" to ricasso, the lack of "Ltd" indicates 1899 to 1900, and made by Wilkinson Sword for Gieves. Nice / slightly different in that it has straight quillons / cross guard and Victoria's VR cypher to blade (most have British coat of arms). Also with black (now grey) fishskin grip for a junior officer, as it was / should be (not white). The 17 3/4 inch blade is in very good condition save for some small patina patches. Blade firm in hilt. The hilt and scabbard fittings retaining some gilt. Hilt in good condition, as are the fishskin grip and associated twisted grip wire bindings. 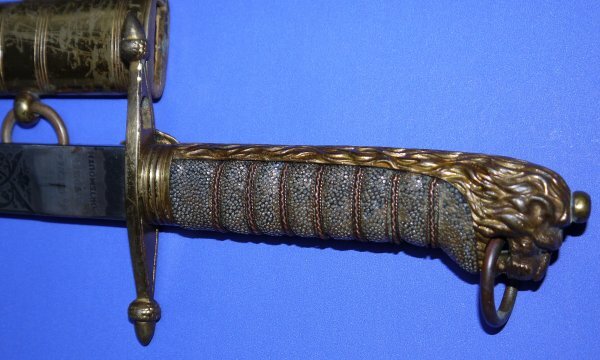 Scabbard in good shape. Locking pin mechanism on scabbard works well and locates securely within hilt. 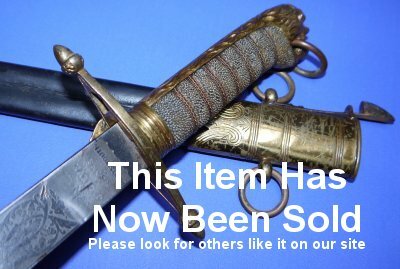 What a tremendous and well above average dirk, yours for £675. Please quote item reference U68. Further / full sized images available upon request. Box 0906-72x17x16 (1.058).